You deserve a kitchen that reflects your personality. Why not start with this stylish and durable Vigo faucet for your sink. Stainless steel finishes with matching soap dispenser all solid brass construction which ensures durability and longer life. Faucet features single function pull-out spray head with power spray. Includes a spray face that resists mineral buildup and is easy-to-clean. The VIGO Laurelton Pull-Down Spray Kitchen Faucet features a dual action, pull-down spray head and 3600 swivel spout that is extendable up to 30 inch, bringing modern freshness to any kitchen with its sleek lines and high arch. Solid brass construction and corrosion resistant finish ensure durability. Stainless Steel Pull-Out Kitchen Faucet with Soap Dispenser You deserve a kitchen that reflects your personality. Why not start with this stylish and durable Vigo faucet for your sink. Stainless steel finishes with matching soap dispenser all solid brass construction which ensures durability and longer life. Faucet features single function pull-out spray head with power spray. Includes a spray face that resists mineral buildup and is easy-to-clean. 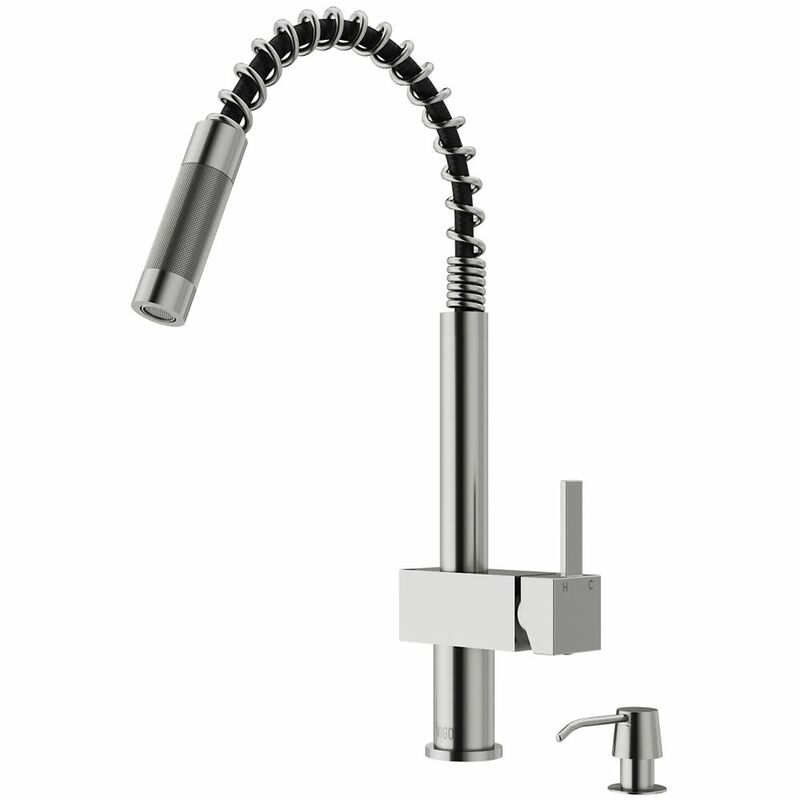 Stainless Steel Pull-Out Kitchen Faucet with Soap Dispenser is rated 4.4 out of 5 by 18. Rated 3 out of 5 by Maynor from l love the look I just renovated my kitchen. Cold water leaking at lever when off. I've just sent my a note to support so hopefully this will be resolved. Rated 3 out of 5 by arizonafilm from OK product It's a nice facucet but the hose is too short and kinks easily at the bottom. And didn't realize this when we bought it but there's no sprayer! What the H?